More than 350 people at Stamford Bridge hear from survivors, Robert Rinder and club chairman Bruce Buck on an emotional night hosted by David Baddiel. Chelsea Football Club in partnership with Jewish News held a gala dinner on Thursday evening to raise funds for the Imperial War Museum’s new Holocaust Galleries in London. 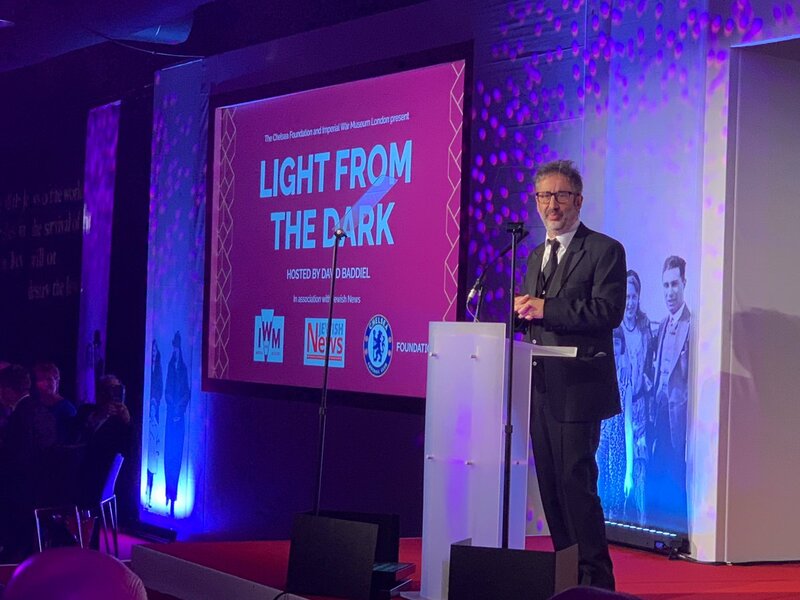 The event, presented by comedian David Baddiel and entitled ‘Light From The Dark was attended by 350 guests including Lord Coe, former chairman of the British Olympic Association, Chelsea FC Chairman Bruce Buck, and Rabbi Nicky Liss, who represented the Chief Rabbi. Recounting his own experiences as a descendent of Holocaust survivors, David Baddiel said: “It seems odd when discussing the Holocaust to be inspired by stories, but the worst events can often bring out the best in people. My grandparents survived, which I think is an inspiration of itself. The Imperial War Museum in London is currently expanding its Holocaust and Second World War Galleries and creating a new learning centre. The museum will become the first in the word to physically and thematically connect the Holocaust with the Second World War. Diane Lees CBE, Director-General of the Imperial War Museums, said: “It is incredible to be here tonight and hear from survivors. On behalf of the Imperial War Museums, I’d like to thank Roman Abramovich, Bruce Buck and everyone at the Chelsea Foundation for organising this fascinating evening. The new galleries will open in 2021. Almost 90% of the funding has already been secured for the project, with £2 million still to be raised. Chelsea’s ‘Say No to Antisemitism’ campaign recently won an award at the London Football Awards. The project, launched in early 2018, includes an educational programme on antisemitism and its effect on Jewish people and the wider community. 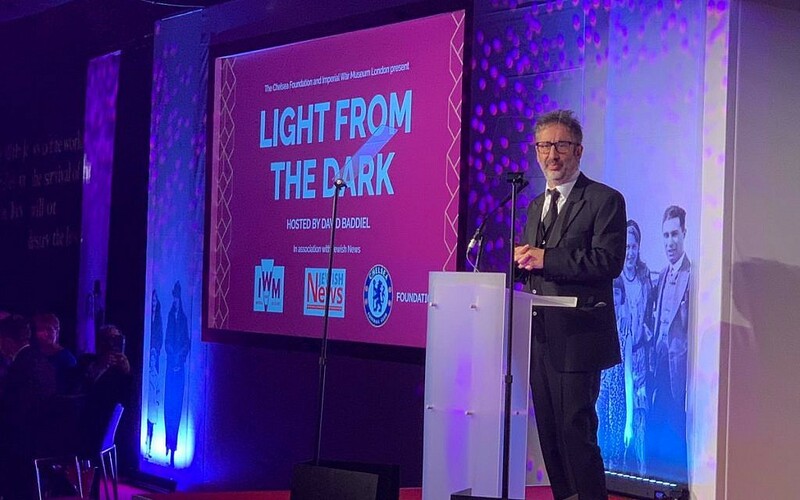 Speaking to the Jewish News, Chelsea FC chairman Bruce Buck, said: “This is a very important event enabling Chelsea to partner up with the Imperial War Museum, bringing awareness to their Holocaust project and our tackling antisemitism project. Education is crucial to help solve antisemitism and the Imperial War Museum is pulling together a project which is certainly going to help in that regard. Under the direction of club owner Roman Abramovich, the club’s dedication to Holocaust education has also included Holocaust survivor Harry Spiro attending a meeting of the first team to speak about his experiences, and an event in Parliament hosted by House of Commons Speaker John Bercow. Guests also heard from Judge Robert Rinder, who recalled his experiences on the BBC show ‘Who Do You Think You Are?’. In a powerful address, Rinder warned: “It is critical to remember that this hate did not emerge all of a sudden- it emerged against the backdrop of democracy. It took place because people forgot to protect democracy, to think about it and above all forgot to remember. Renowned journalist Hella Pick, who arrived on the Kindertransport from Austria, also discussed her experiences with Michael Attenborough, whose family hosted two German-Jewish girls for seven years from 1939. The evening featured a live auction bid, with prizes including a private tour of the Churchill War Rooms, the experience of flying in a Spitfire and VIP travel to a European football match with Chelsea FC. There were also raffle prizes, including a signed Chelsea FC football and a DC Vintage Bakelite telephone. Robert Singer, CEO of the World Jewish Congress, which has worked closely with Chelsea FC in countering antisemitism, said: “Chelsea is doing a fantastic job in leading the charge against antisemitism in sports. The only way to deal with Holocaust denial, and all forms of antisemitism and hatred, is through strong leadership. This means publicly denouncing and condemning antisemitism whenever it rears its head. Guests also heard live music by the Topaz String Trio, who performed works by the composer Hans Neumeyer written before his death in Theresienstadt in 1944.